Mahadeva is the creator of Trilok. He is Shiva , he is Parameswara. The worshipers of Lord Shiva always believe that he is Swyambho. It means self creator. We strongly believe that if we can please Lord Shiva , he surely will bless with his enormous blessings such as it can be money , finance , health or happiness. He can fulfill our wishes and can make us wealthy and healthy. In Kalyug just offering prayers infront of an idol of Lord Shiva is not enough. It has been mentioned in Bhavishya Purans about the importance of chanting mantras for mental peace and happiness. Same as daily chanting the Mahamrityunjaya Mantra – the mantra of Lord Shiva will give you wealth and good health . The ups and downs, the troubles will come but this powerful Mahamritynjaya mantra will provide the enormous power to face all those situations and will surely help us to survive and will give a long peaceful , positive life. This mantra will surely help you out of Months , Gochara, Dasha, Antardasha, or any other kinds of problems in your kundali or Vedic Horoscope. Mahamrityunjaya Mantra cures any types of diseases or illness. The worshiper of Lord Shiva , who will utter this mantra devotedly can get the prevention from ultimate death or can delaying of death for certain period . It also prevent the epidemic, division of property and also helps in the situations of familial discord. You will surely get a huge result If you are going through some financial difficulties or in miserable condition in business by chanting this mantra every day. 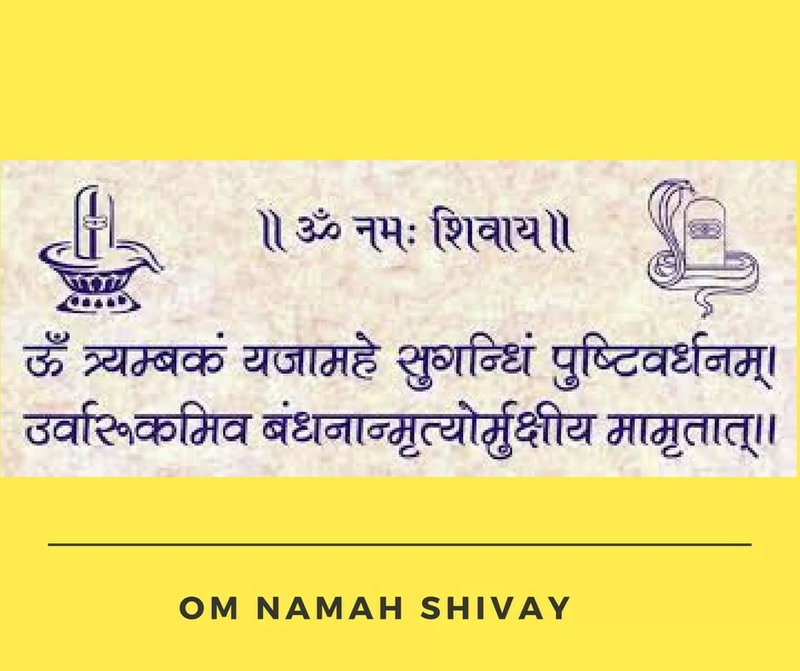 We get alleviate power by chanting this Mahamrityunjaya Mantra and it helps us to remove the fear of death . Moreover it liberates us from ultimate death and rebirth cycle . It is also called moksha mantra. Bandhanan : Stands for bound down. If read with urvarukamiva, it means ‘I am bound down just like a cucumber to a vine’. Early in the morning (2-4) is the best time to chanting this mantra,according to Sastras. Someone ,if cannot do it during this time ,then after he or she can chant this mantra at least five times a mala. It is very auspicious to use a Rudraksha mala at time of chanting this mantra. Rudraksah mala will help you keep the track of the number of times you have recited the mantra. Your mala count has to be grater than the previous day. Full concentration you have to give on the sound vibrations of the mantra and realize the meaning of mantra. Do not divert your mind in external factors. It will be best for you if there is is Shiva’s idol, Shivlinga or Mahamrityunjaya Mantra next to you while you are chanting the mantra. You will get the result soon If you leave non vegetarian food. Mahamrityunjaya Mantra is very much effective in every aspect of our lives.